Welcome to the space in the house that barely ever gets used! Ha! I hate to say it, but it’s true. This is our formal living area! Why is it that these spaces exist in the front of so many houses? Even our last house had one and it was only 1400 square feet. Oh well. 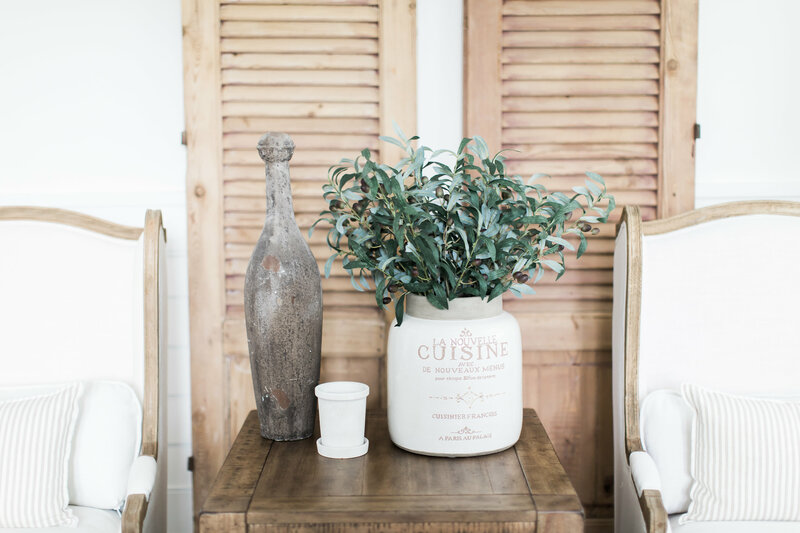 These weird little spaces are in many homes, so I’m sharing mine today on the blog to give you some inspo for your space! This was the one area in the house that I really thought I could do more formal. I wanted it to be beautiful since it’s the first thing you see when you walk in our front door, but I also wanted it to be cozy. And I feel like a good couch is where you start when you’re looking to make a living space cozy. And in my opinion, there is one main thing to look for in a comfy couch and that is depth. You definitely want a couch that is on the deeper side. This allows you to sit further back and get really cozy. And the great thing about our couch is that since the pillows are loose, you can stack them in a certain way so your back is supported if you want to sit up straighter on the couch. But if you feel like lounging you can move the pillows around and back farther. You can’t really do that on a couch that has structured cushions. And can I talk about this gorgeous fabric? I am so obsessed with the fabric on our couch. So much so that the sectional couch in our family room is made from the same fabric. When you click here to look at the couch on Wayfair’s website, choose the Bevin Natural fabric. 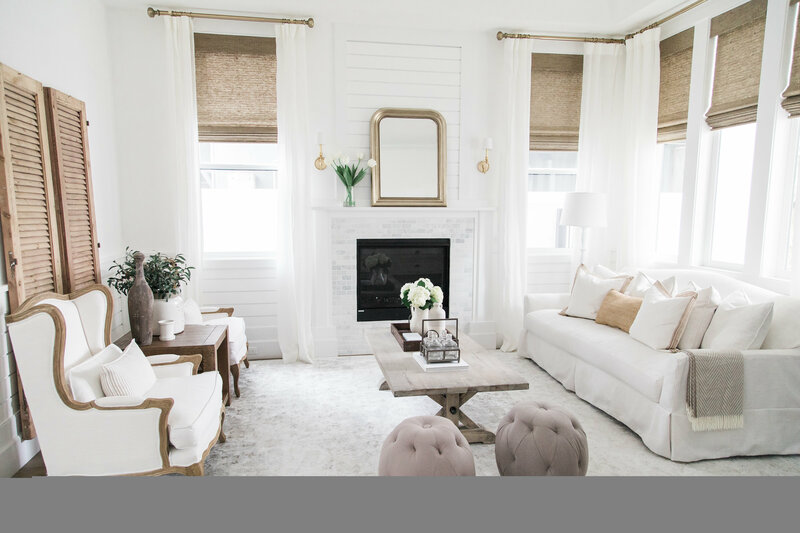 It’s no secret to you guys that I love all things white when is comes to home decor – especially in this room. And the great thing about this couch fabric is that it gives the appearance of an all white couch but if you look closely, you’ll see that the fabric has tiny brown specs in it. This is so key because it doesn’t get dirty nearly as fast as a pure white couch would. Put it this way, this couch is Owen’s favorite spot in our entire house to take naps. And it still looks this white! It’s such a cool fabric and if you’re interested in taking a risk on a white couch, I highly suggest you request a sample on Wayfair’s website. The samples are free and you can check it out for yourself and see if it would work in your home. 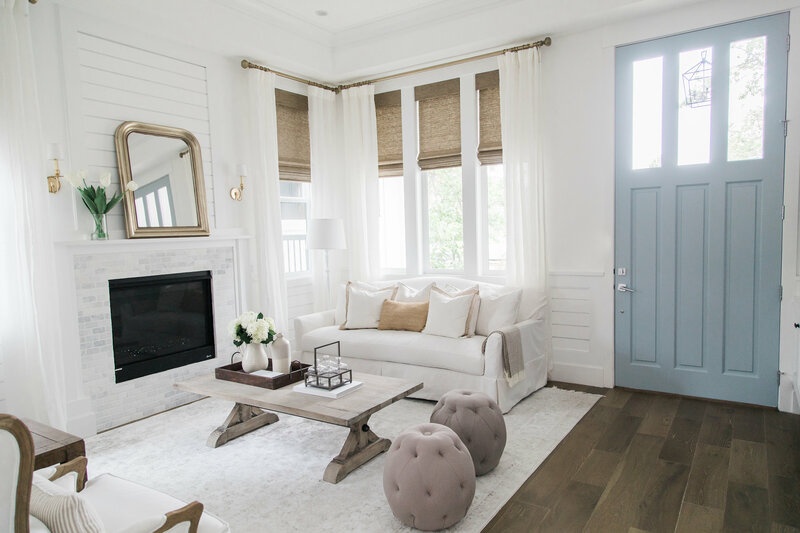 Speaking of wanting things white and bright, how beautiful is our rug in the space! This is another item that we love so much that we used it in two spaces in our home. If you saw my blog post on our master bedroom, you might notice that this is the exact same rug we have in our master. We initially bought it for this space and loved it so much that we decided to replace the original rug we bought for the master. I love it because it gives you the brightness that you would get with a pure white rug, but it’s not pure white so dirt doesn’t show up on it nearly as easily. If you look closely at the rug, it actually has a lot more silver and gray in it than white. But all of those colors reflecting off each other give the appearance of a very white and bright rug/space. And to give you an idea of how good it does with dirt and little spills, I can tell you that Owen has thrown up on this rug twice, and you can’t even see where because of the pattern and colors in the rug. And this rug is super affordable! You really can’t beat the price and I think it looks super expensive. We have the 10×14 size for this large space, but it is out of stock. But other sizes are still available! 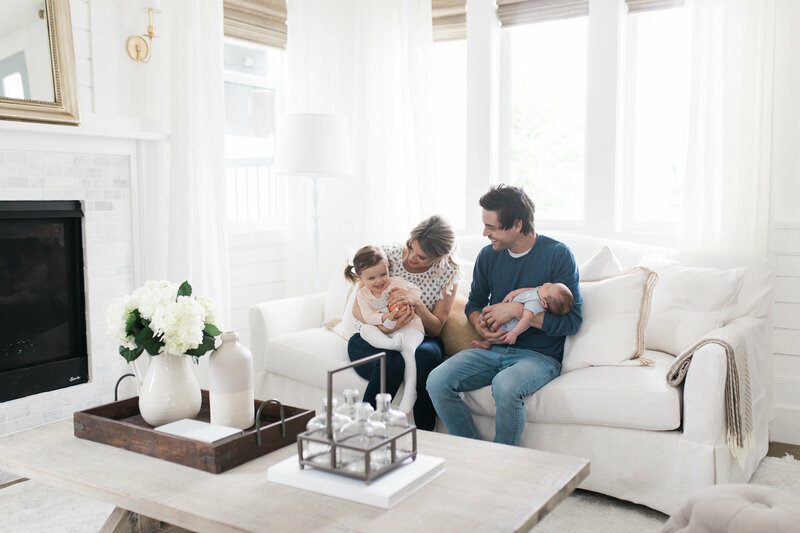 And I know a lot of you think I’m crazy for having so much white in the house (and I get it’s not everyone’s cup of tea), but Veronica and I were really strategic about it – hence the Bevin Natural fabric on the couch and the gray and silver mixed in with the white in the rug. There are ways to do white and make it stand a better chance against stains. And I think most of you know who Veronica is by now – especially if you’ve read read my past home tour blog posts. 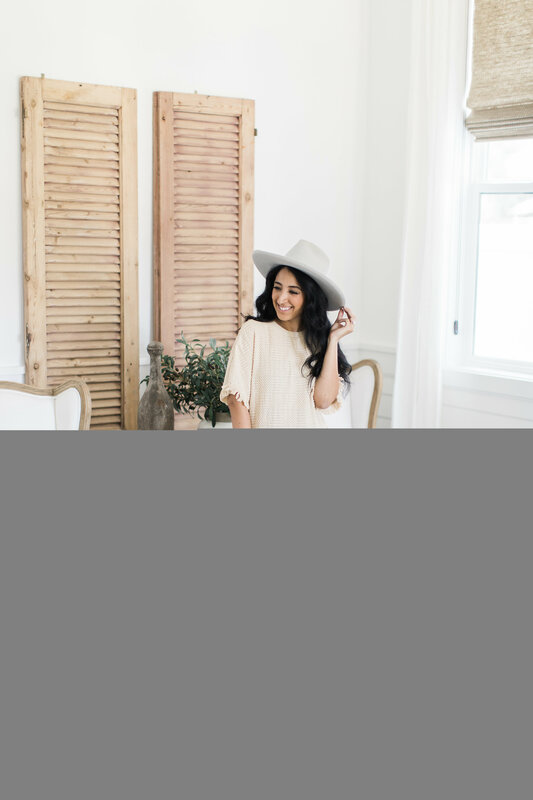 Veronica Valencia is our incredible designer who helped us design all of the spaces I’m sharing in my Ali Luvs home tour series. My friend and fellow Bachelorette Jillian Harris actually introduced me to Veronica. And as soon as I checked out her Instagram account, I knew she was someone I wanted to work with. She has such an incredible eye for design, and what impressed me most about her when we worked together was her ability to completely understand what design aesthetic I was going for even though I had a hard time putting it into words. She’s just the best and she’s about to become a first time mama! So head on over to her Insta page and give her some love! Veronica is not only a great designer, but she also has her own line of blinds at select blinds. We used them in every room of our house. In this formal living area we used the Veronica Valencia Oceania Woven Wood Shades in a color called Island Earth. 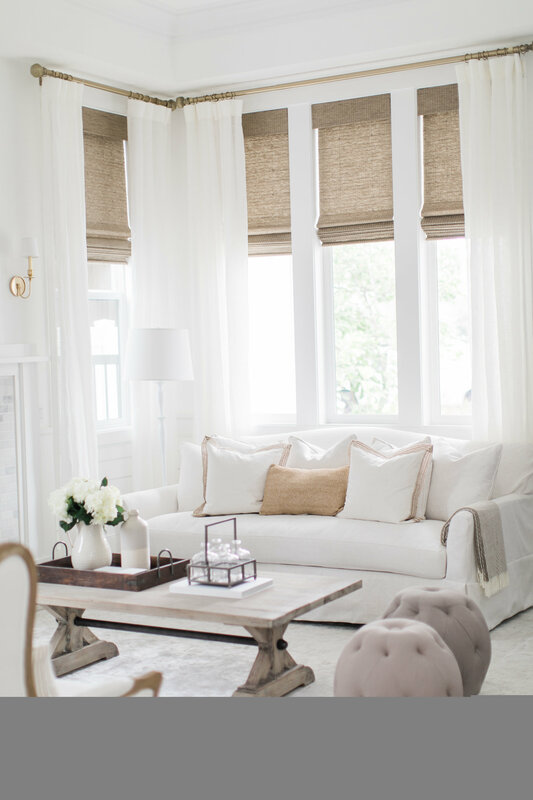 I love the neutral color and how it brings warmth to this very white and bright space. Also, since the windows are so high in this area, the front blinds go up and down by using a remote control. Pretty cool huh?! I didn’t even realize you could get that feature on blinds. I thought they only existed in Vegas hotel room. Ha! 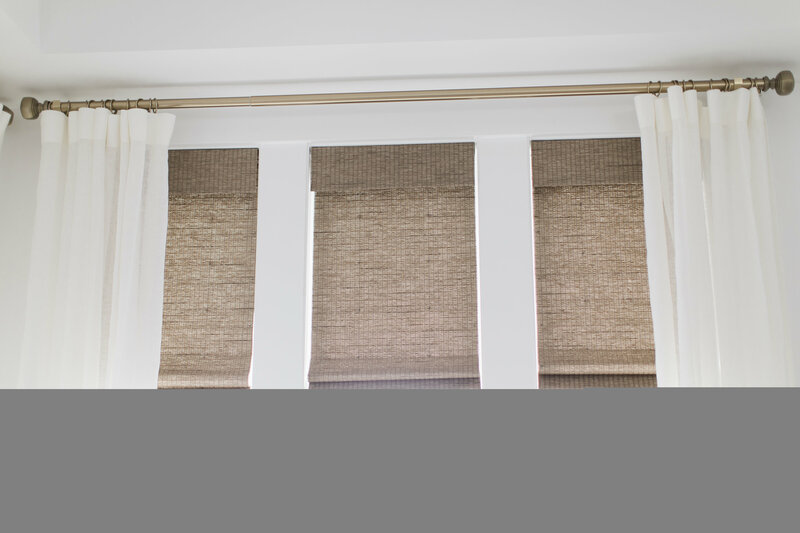 And our custom curtains and hardware in this room and throughout the rest of the house are by Loom Decor. I feel like in some of these photos the white curtains almost feel like it’s too much white, but I promise you in person they make the room feel so ethereal. Sometimes I feel like I can go in that room, open a window to let the breeze in and it feels like I’m in a dream. It truly is just an absolutely stunning space that makes me feel peaceful when I need a moment to myself. Do the chairs in the pic below look familiar to you? If they do, that’s because we used one in Molly‘s room as well. I feel like when you find something you like, stick with it! If you read my blog post on the decor in Molly’s room, then you know that we originally bought these chairs for this space and loved the color of them so much that we got a third one for Molly’s room. I feel like sometimes when you’re looking for white fabric, it can show up in the mail and look off white or dingy. I just really love the pure tones in this particular white fabric. Given all the white in the room, Veronica stressed to me that it’s important to add wood-tones in other places. So we went with this side table and a farmhouse style coffee table. Our particular coffee table is no longer in stock, but I found this one that is similar and gives that same farmhouse vibe. For the wall behind the chairs, we originally looking for a big piece of art. However, I couldn’t find one that I really loved and I didn’t want to just pick something for the sake of finishing the space. Art is such a personal thing and I feel like in the future when I see something I love, I’ll get it. But I didn’t want to force it. With that said, I wanted the space to feel finished so instead of rushing to buy a piece of art, Veronica suggested that we put in vintage shutters behind the chairs. She found them at an antique flea market and I’m embarrassed to even say how much they were so I’m not going to. Ha! But I found super similar ones online that are much more affordable. 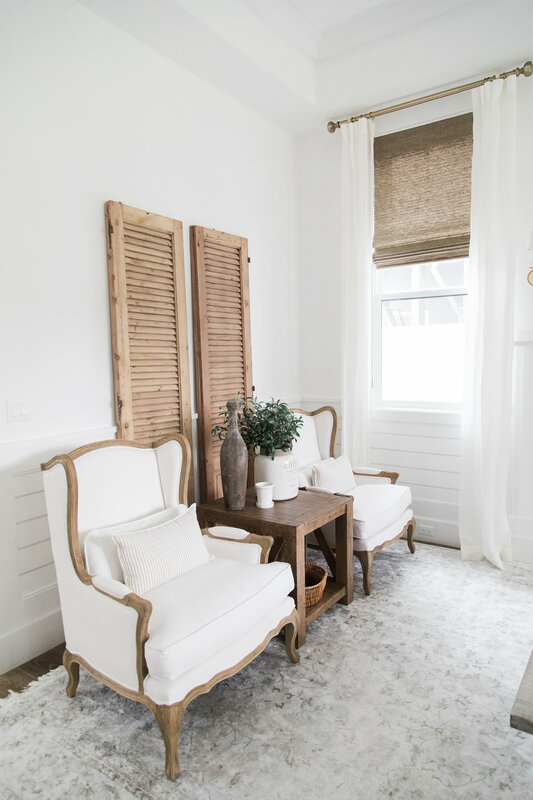 I love them because I feel like the look of the shutters bring some character into the space. And because our house is brand new, it’s really important to bring in some older elements when possible. I will say though, Veronica and I both feel like the space above the shutters feels a bit empty. So we are on the hunt for something to put there. Let me know if you guys have any suggestions! I was thinking maybe like a cursive word made out of iron or something like that. Maybe I could find something on Etsy. Since that wall is the first thing you see when you walk in the door I was thinking it could say something like “Family” or “Welcome Home” I dunno. Maybe that’s cheesy. I want your ideas! Tell me what you think we should do with that space in the comments below! The bowling pin and vase on the side table are both from Home Goods so I don’t have direct links to them, but I found a similar bowling pin here and similar vase here. And the greenery is faux olive branches! I use these throughout our home. It’s so hard for me to keep plants alive and these add much-needed greenery throughout the house. These are by far the best ones I’ve found. What else? We stuck with gold tones around the fireplace by using gold sconces and putting a gold mirror over the fireplace. One thing I really do love about a formal living area is that I don’t have to put a TV over the fireplace. There’s a TV over the fireplace in our master bedroom and in our family room since well, we want to watch TV in those rooms! 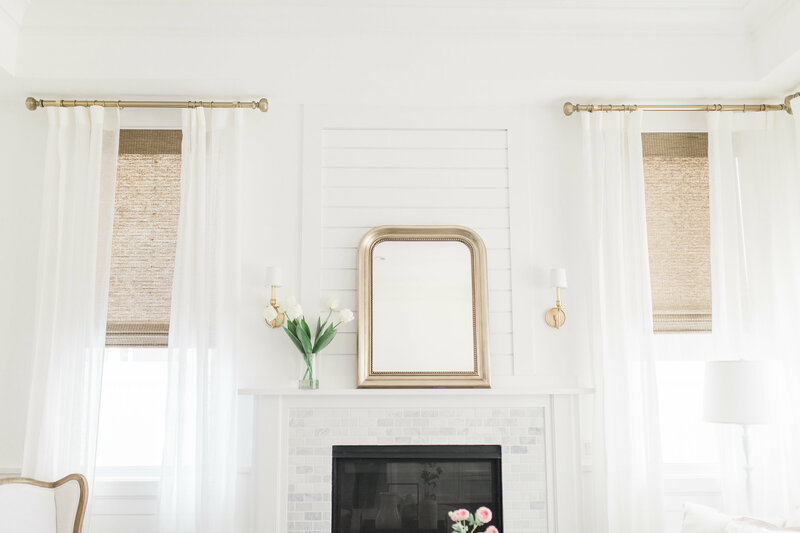 But I absolutely love the look of a mirror over a fireplace, so I’m so glad we got to do that in this space. And last but not least, Veronica suggested we use some ottomans in the space to add extra seating. Of course I wanted to get white ones and she strongly urged me to go with a neutral tone. I’m really glad she convinced me to do that because I think they bring in some much-needed neutral tones. I’ll also link my top HERE for those interested. Ok that’s everything that I have links to! Let me know if you guys have any questions. And don’t forget to send me ideas for what we can put above the shutters! I need IDEAS! Put links to things in the comments below! My daughter and I (not the boys, haha) use the living room all the time. Yours is too beautiful not to sit in. Just bring your laptop or mail and enjoy the serenity. SOOOOOO beautiful! Thank you for doing this series on your home. It has given me so much inspiration! I have to know the color of your door? 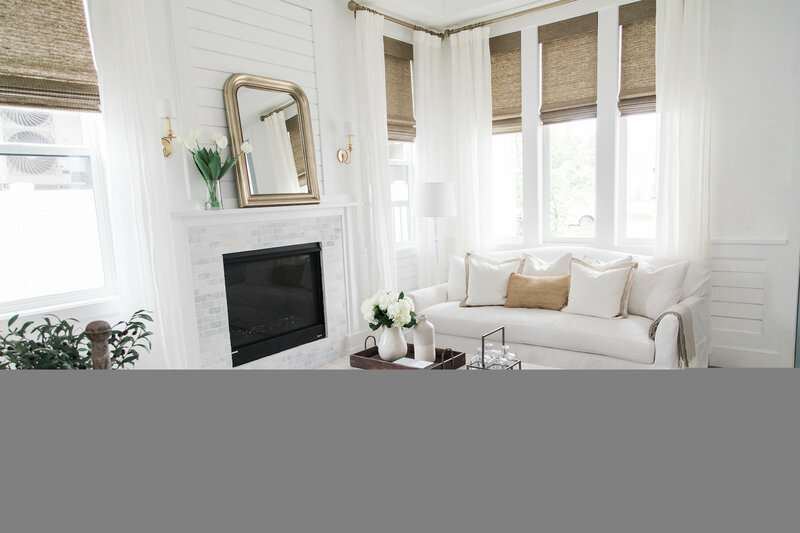 It’s the perfect accent color for white! So pretty! The door paint is called Blue Heather by Benjamin Moore! Your house is beautiful—it looks like a catalog or a model home! Where do you keep your “stuff”? Newspaper, magazines, mail, keys, shoes, misc stuff that comes in the house with you? It’s all I see when I look around my house! There is a built-in on the other side of the door that has all our keys and sunglasses for when we walk out the door! The built-in’s in our house are key! Your home is so lovely! As a professional organizer, are you showing a tour of your closet??? Please??? I love your style for your home and clothes. And you’re such an inspiration as a mother! My closet is A MESS!!!!! Ha! I need to clean it up and organize. I haven’t done that since we moved in. I think ironwork above the shutters would work, but would not go with words. Too casual for a formal room, and so overdone. It should be more unique. Like you said, you will know it when you see it. I kind of agree with you. I just don’t know what!!!!! I think a word could work if it wasn’t in cursive. I love your home posts! But I wanted to ask you where is your shift from in the Instagram story you last shared? It’s the black shirt with the zipper down the front. I bet it’s great for breastfeeding! LOVE the Bevin natural fabric! How Many square feet is your new house if your last one was 1400 and I recall you saying it was “too small” or was it 1400 between 2 levels? It’s always interesting to me how much space people need to live in with kids, their stuff and day to day living styles! 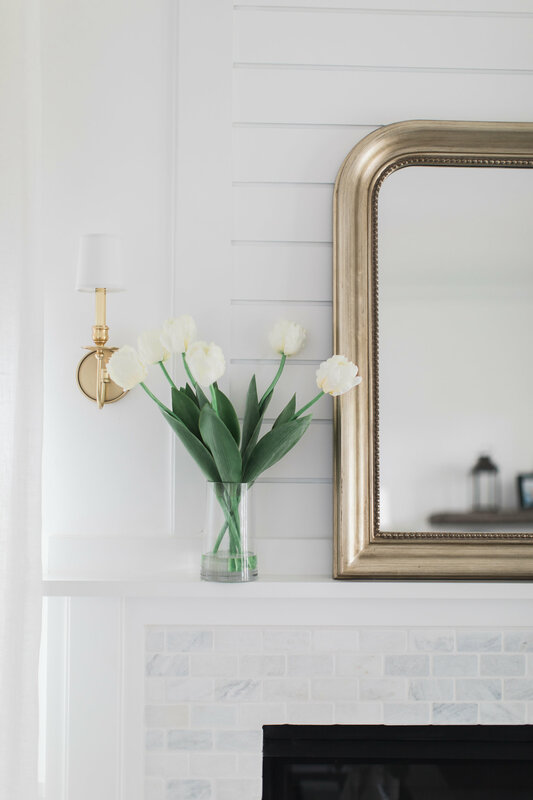 You should get a cut from Wayfair you are such a good ambassador for them😊it’s really got me shopping at Wayfair way more than usual because I love these posts for inspiration!! It was 1400sq ft TOTAL meaning all on one floor. It was cozy and we loved it but we needed more space. This house is much bigger at 3950sq ft.
And I’m sooo glad my posts are inspiring you! Yay! Paint it! Paint is so inexpensive and it will make decorating so much easier! I don’t know if I 100% understand what you mean Mary. The shutters are flat on the wall so they can’t really be opened. Sorry if I am totally missing something! Tell me if I am!!!! Thanks for the comment! Are you going to post your backyard in one of your home tours? Also, if you find an iron word or letter can you please post it. I am been in the search for one made out of iron. I was planning on it because there isn’t much back there yet except kid toys. Ha! But maybe if I set it up nice at some point in the future! We have a balcony that I still need to buy stuff for! Totally understand! Could you tell me where you guys got your pool fence done and or the brand of it? I have a toddler and we are looking for something similar to what I have seen in your posts! We want something not permanent. Thanks!! I love it! Finally found something on your house that I have in mine! The white tulips over the fireplace! 😁 Maybe an ironwork in a design over the shutters? Or a tapestry? 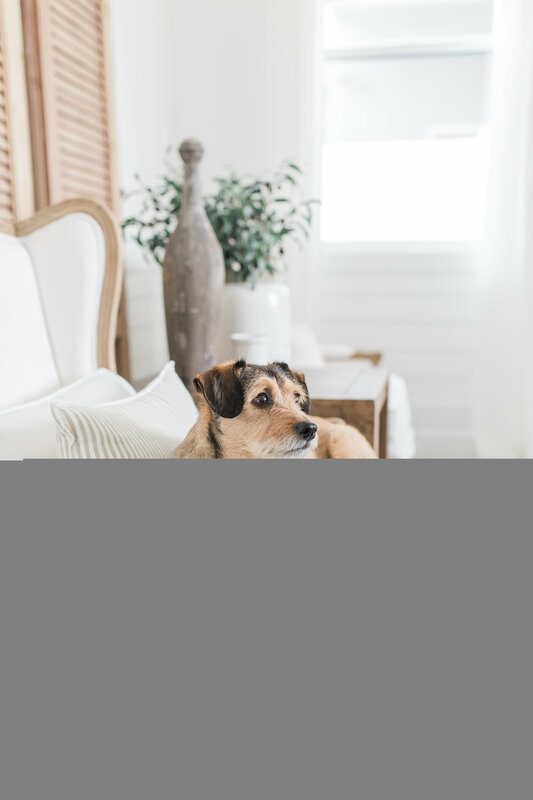 Love your home tours! Thanks for sharing! I LOVE faux flowers and greenery. So much cheaper in the long run then continuously buying real ones. We recently had a sign made on etsy for a space in our house near our front door that says “it’s so good to be home” and I love it! Ohhhhhhh I like that!!!! I might steal it! You mentioned the house is new, no one lived in it before? Did you guys build it? Or did you at least get to pick out the flooring and counter tops? Love love that you include picture with your family and dog. I didn’t realize just how big and beautiful everything is until I could see you all in it for perspective! The house was new construction when we bought it. So no one has lived in it before but we didn’t build it. We are very lucky to live here. I remind myself that every day. That is such a thoughtful idea. It means SOOOOO much to me that you remembered this story I told. I tell it to keep my grandmothers memory alive and you did just that by letting me know you remembered it. THANK YOU!!!!! From the bottom of my heart! I absolutely love your home Ali. You and Veronica did an amazing job. It would be really cool if you could post before and after pics so we can see the transition. Also, I love how you show equal pics of your family. For instance, when we see a pic of Molly, you always follow up with a pic of Riley and also Owen. the fireplace is sooo pretty! I’ve been looking for some inspiration and the way your fireplace looks is now my dream fireplace! Was it tiled over? new brick? do you mind sharing what was used? thank you SO much! stunning home! Check out Laurenwilliamsart.com / @laurenwilliamsart on instagram. She makes beautiful hand-dyed tapestries that would be perfect for the space above your shutters! Thank for the rec, but I’m not sure a tapestry would be the right fit. But I’ll check her out! Ali it’s so pretty! Please share your favorite white wall and trim paint please!! I don’t know it! The guy we bought the house from said it was the standard white from Edward Dunn. Hi Ali! Thank you for sharing your home tours with us. Your home is so beautiful! I love the idea of a phrase above the shutters in metal. What do you think about Manno? I think it would add a personalized touch! I like where your head is at. I like it. I think I might be leaning towards a quote the more I think of it. One that means something to us. Beautiful space! I highly recommend checking out Feather and Birch on Etsy! She makes beautiful wooden cursive words and has a HUGE selection. She is also open to custom orders! Thank you Amanda! I will check that shop out now! We use our formal living room as a playroom. However we have a separate foyer so people don’t have to walk straight into it. We get tons of use as a playroom and it keeps all of the toys (3kids worth) contained. Yours is certainly beautiful though. I still want to see a better picture of your blue pantry door in the kitchen. I noticed it when you showed your dining room. It looks amazing! As always I love your posts and your house!!! Who makes your coffee table. It is so pretty!! Thanks for sharing so much with us!!! good prices. Please check them out. Love your little family. Can you do an update on Riley? Your routine, how he’s doing, etc?! Not sure how big the wall with the shutters is, but what about a subtle wallpaper, maybe even something removable for when you find the “one” art piece. I’m thinking just a hint of a pattern with a fleck of gold in it perhaps? The home is so lovely by the way! I dont recall you mentioning the 2 round things in the living room that look like bean bag chairs. Sorry cant think of a better word to describe it, but they are cute. Are they actually for sitting or just decoration? I didn’t read all the comments so I’m not sure if this was said. However, I think your last name would look nice above the shutters! Where did you get your throw blankets from in your formal room? Ali, why not put something in neon above the shutters. Whether it is a random word like bliss or your last name or just a great squiggly line? Where are the window shades from? I’m looking for similar ones for my dining nook. For some reason I was thinking you built this house?? But maybe that’s not the case since you are talking about a room noone uses? It’s very pretty, though! I love trees. Internet search wrought iron trees (or anything else you love). Personally I’d like a tree or flower or butterfly rather than a word. I’ve seen some amazing pieces at craft markets. Hi Ali! Your house is perfection. Do you happen to know the name of the gray console/media table in your home? 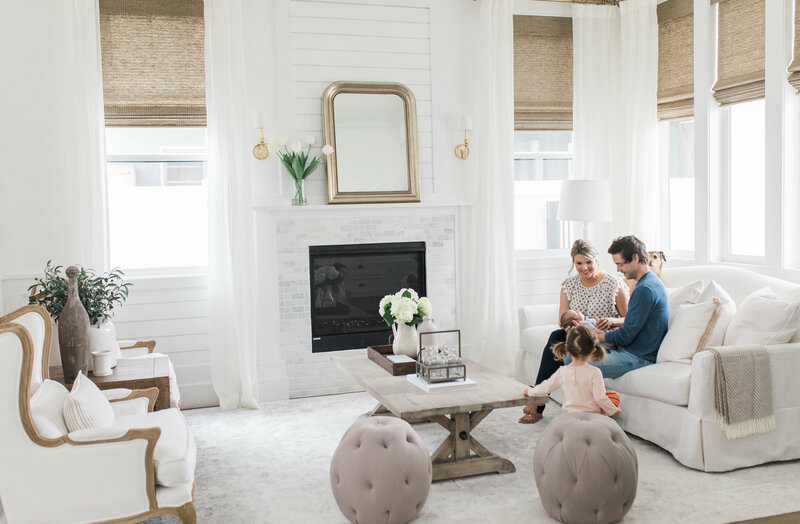 Sorry, but with two children under the age of 2, and you basically went with all white decor?????? ……duh!!!!! Beautiful home and pictures! I am totally inspired by your work and got some great ideas. Thanks for sharing. I love your blog and IG posts. 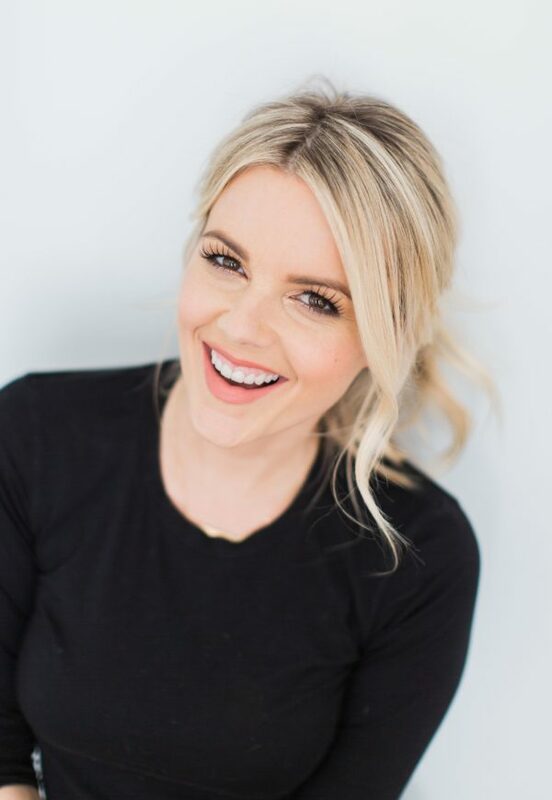 I have been following your journey since the Bachelorette days. I am currently looking for shades for my home. I love yours and have ordered samples of Veronica’s blinds. But I am wondering, what color privacy liner did you choose, if at all? Hi Ali! Could you post your coffee table that was out stock please. I’m hoping to keep an eye on it for when it comes back! Thanks! This room is beautiful. Can you tell me if you needed to use a rug pad with that rug that you choose? Would you mind giving me more details of your curtains? I would like to get the same curtain color/gold hardware combination and the website has so many options! I love the ones you picked!